My Kiss My Sass July Lip Addicts Anonymous arrived, and this month's theme was Apple Pie! I think that's a great alternative to just red, white, and blue for the Fourth of July. And we even got to try some other summer appropriate samples this month. The taffy we got was so good too, it was also apple pie flavored! Shipping - I want to mention the shipping cost for this subscription increased for US customers by $0.25. I didn't even notice the change, and we were never notified ahead of time about the change. My subscription shipped on the 6th of July, and arrived 2 days later via USPS from Pennsylvania to California. Product Size - We received one full size product this month, and the rest were sample sized. 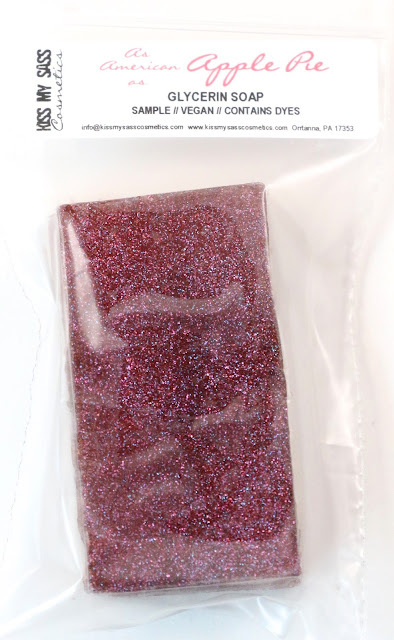 Free Samples - We received a bonus sticker from Darling Girl Cosmetics as well as a coupon code for that shop. Here's the info card this month. Keep Calm & Love A Soldier - "A mix of red, silver and blue shimmers." This Sheer Lip Glaze is Apple Pie flavored, and I think it will make a great base for when I want to turn an eyeshadow into a lip color. Or just as a simple clear gloss with some sparkle. As American As Apple Pie Soap - "Apple pie topped with vanilla ice cream and caramel rum drizzle." This smells pretty good, I just don't know if I will use it. I don't really use bar soaps, and I don't like glitter in my soap. 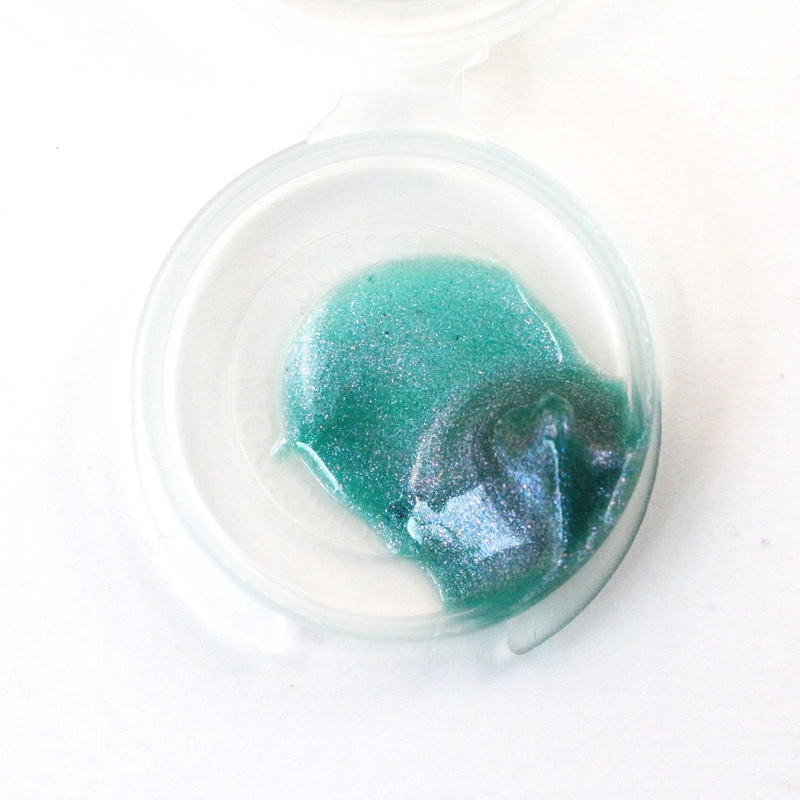 Mermaid Lagoon - "A sheer teal with multi colored sparkles." I believe this product was a limited edition product in the past, and some fans expressed some interest in bringing it back. This one was coconut flavored, but it kind of made me look dead. Sheer blue glosses are apparently not for me. Island Cocktails - "A sheer orange with multi colored sparkles." This one was flavored island cocktails, and I really liked this shade. 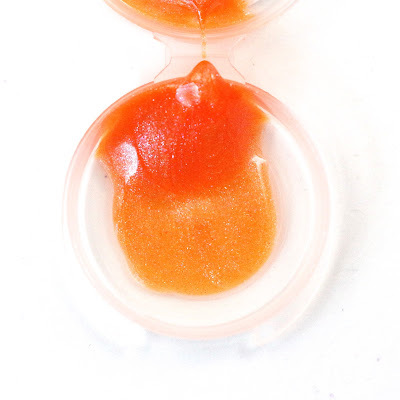 It's orange, but shows up as kind of a coral color depending on how pigmented your lips are. And I like all the sparkles in this, they show up really well. This is something I would consider buying a full size of. We also received a sticker from Darling Girl Cosmetics, and a coupon code. As well as Jamberry sample as Elizabeth is an independent consultant for them. I'll express my feelings about this in the Customer Service portion of my review. Overall, this month's subscription had a total value of $13 not including the extras. 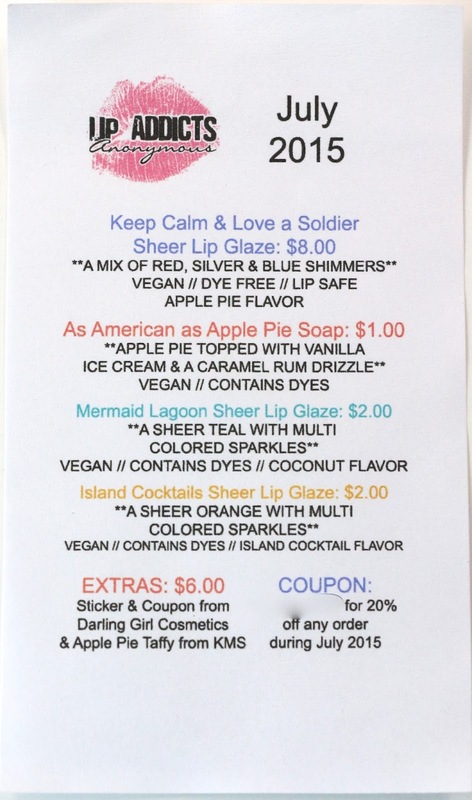 I like the Keep Calm & Love A Soldier and Island Cocktails glosses. The soap and the Mermaid Lagoon gloss though will probably go unused. I do hope we get a lip product with more color next month though, I just don't have much use for a clear lip gloss, other than to mix lip-safe eyeshadow with. And maybe that's a project I could try, but I think my favorite item this month was Island Cocktails. I kind of wish we had gotten a full size of that instead. I liked the theme and that red and blue were used as sparkles in some of the products, that's a creative idea. Customer Service - I did not have to contact customer service regarding any problems with my subscription. However, I did contact Elizabeth regarding her new Jamberry consulting business as it was posted about in the Kiss My Sass Facebook group, and is linked on the website. I expressed some concerns about wondering if we would start seeing it advertised in the subscription, and that would really turn me off as a subscriber. I've tried Jamberry before, and didn't care for them, and I know others don't like them because they see their personal friends selling them on Facebook. She replied that she just wanted to let people know she was available as a consultant if they were interested and seemed to take my email a little more personally than it was meant to be. I assured her I was just trying to be honest about my feelings as a customer, and not wanting Jamberry to be featured in the subscription, because I feel like Jamberry should be treated as a completely separate business to Kiss My Sass. And here we are with a Jamberry sample in this month's sub. I really don't know how to feel about it. On one hand it was just an extra, but on the other hand, it makes me feel like my concerns weren't taken seriously. I don't even know why I should have to say this, but of course it's her business to do with as she wishes, and as a customer it's also my prerogative to stop shopping there. I have no use for the sample, as it was Fourth of July themed, and I didn't receive this until after the holiday. I'm really on the fence about my subscription, it might just not be for me. I really don't like pushy salespeople, and if I can overgeneralize for a second, I feel like Jamberry consultants, and other companies like them, are pushy. If it was only supposed to be one Facebook post, and a link on the website, then why are we getting a sample and her Jamberry business card in our Kiss My Sass subscription? I just feel like it doesn't belong there, and I don't want to be used as an advertising platform for another non-indie business. Overall Satisfaction - My favorite this month was Island Cocktails, and as I've said, I'm kind of on the fence about this subscription. I thought I wouldn't mind other non-lip extras, but I just have so much perfume/soap/eyeshadow that I really don't need or want those as extras, because they will just go unloved in my stash. I will see what next month has in store, and then reassess. This was the first month for me and it was a bust. I see your point about the jamberry, but mine just went into the swap box. I wish she would have sent a red lipgloss...I dislike clear lipglosses, and would just rather use something with a little bit more color. I liked the blue lip gloss if I use it very sparingly but I loathe clam shells-they're just not travel friendly. I don't use bar soap, but figure I'll use this in the bathroom the hubby doesn't use so he doesn't complain about the glitter. I told myself 3 months-if next month is a bust, I'll cancel...if it's good, I'll wait another month. I did have great customer service when I subbed-I got an email thanking me and asking if I had any questions. That's a good idea, if only I still swapped stuff! It just got too expensive, so anything that's a duplicate, I save in a box for gift giving. I really liked last month, so I'll probably give it one more month before deciding. The Jamberry thing would have rubbed me the wrong way too, if I subscribed to this. I want indie boxes to be, you know, actually indie.